← Do you understand i18n? Here comes Thunderbolt – where’s wireless USB? If you take a look at the Apple website – and can take your eyes off the iPad 2 – you’ll see that the current MacBook Pro seems to have gained another port. Well, not so much gained one as repurposed it – the “mini display port” is now a “thunderbolt” port, and can handle all kinds of other stuff as well as sending video. Apple claims that “ultrafast and ultraflexible, the Thunderbolt pipeline is more than 12 times faster than FireWire 800 and up to 20 times faster than USB 2.0”. What is perhaps more interesting is what isn’t there – USB 3.0. Techrepublic has a good post on this, making a very good case that the future of connections is to go wireless using Wireless USB. However, perhaps one reason Apple and Intel are moving ahead with Thunderbolt is that there is some uncertainty in the “personal area network” market, with Wireless USB, Ultra-wideband (UWB) technologies such as Freescale’s Cable-Free USB, and also the emergence of Near-Field Communication (NFC). 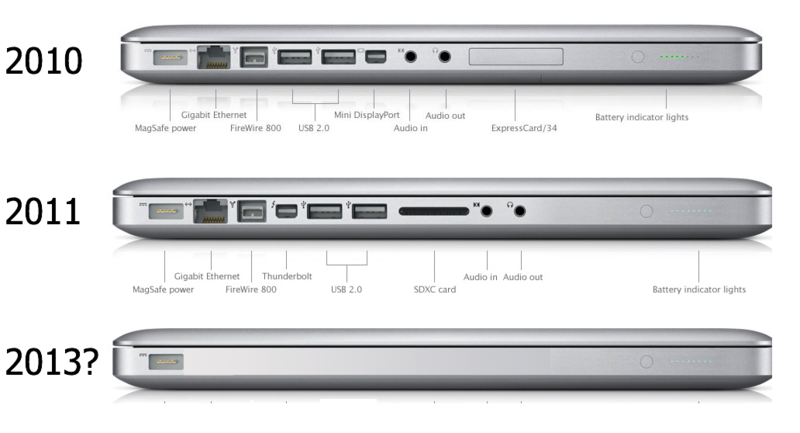 In the short term it might be useful for Thunderbolt to merge video and high-fidelity peripheral ports (e.g. Firewire). But for the longer view I think Jason at TechRepublic is right in thinking about wireless – for one thing I can’t imagine Apple not taking advantage of an opportunity to make their devices even shinier. Another opportunity offered by wireless is to move port and protocol interoperability into software rather than using poka-yoke to stop users sticking things in the wrong places. The whole business of ports, wiring channels and chipsets is then replaced by a “personal area network” hub and software drivers for different protocol types. Another reason I can think of for going down the Thunderbolt route is that there are display technologies coming out that push bits at a rate that can’t be handled even by USB 3.0 – for example 3D or displays with super-high-density pixels (like the iPhone’s Retina display writ large). In which case we might see some form of wireless USB replace everything but Thunderbolt. This entry was posted in nfc, standards. Bookmark the permalink. 6 Responses to Here comes Thunderbolt – where’s wireless USB? Scott interesting but let me guess its an apple standard ! NFC is going to hit in a big way US banks doing trials already and one London borough is using Oyster card NFC tech for use in schools. Thanks again useful post !! Its actually something started by Intel that wasn’t moving very fast until Apple joined in; Apple has licensed its “Mini DVI” adapter type for use by Thunderbolt as far as I can tell. But yes, its a proprietary standard, and it hasn’t exactly impressed the USB 3.0 community. Yes one can imagine but USB 3 isn’t exactly popping up every where or rolling out fast !! They seem to change the bloody display port with every new MacBook! As for NFC…well, you chaps know I’m interested in this. I just wish I would hear about it in terms other than ‘mobile payment’.